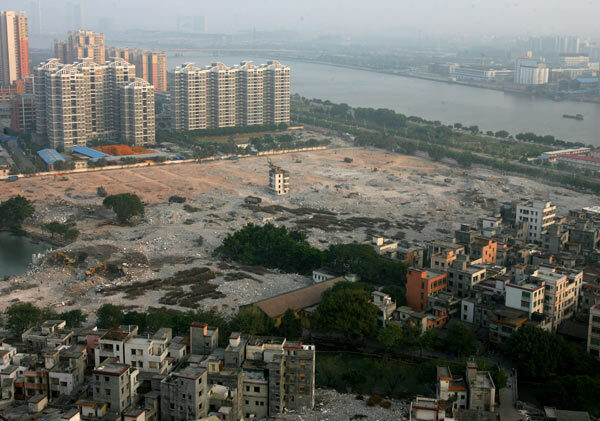 China is not the first place to see massive building projects wipe out organic urban geographies, but the scale and pace of the current transformation is unprecedented. 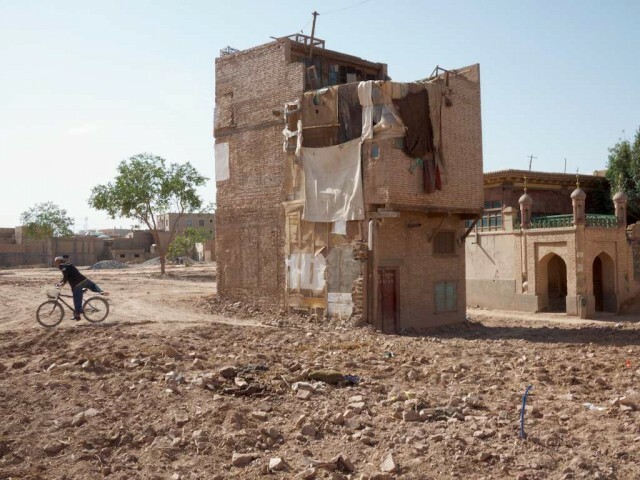 Some recent projects have nabbed the headlines — the Olympics in Beijing, the Shanghai World Expo, the transmogrification of Kashgar — but hundreds of lesser-known cities are seeing similar levels of change. Every so often, the master plans of developers don’t align with those of an existing home owner. The negotiations, coaxing and intimidation that follow can reach absurd levels, while surrounding buildings and utilities are removed. 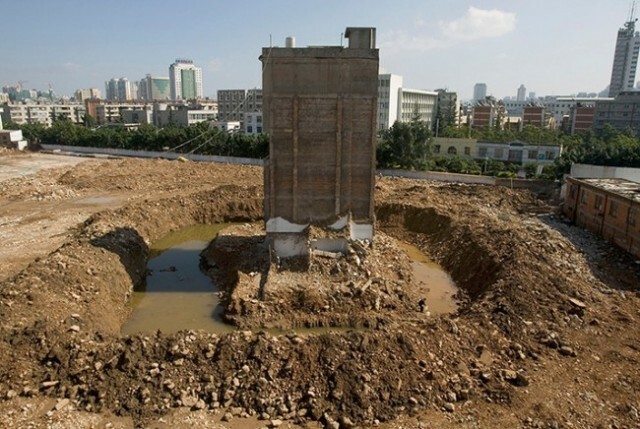 The remaining “nail house” (钉子户, dīngzi hù) fittingly reifies the defiance of its owner, but in the end, the lone holdout almost never proves a match against the unstoppable forces of dialectical materialism. Nail houses captivate us — and not just because of the good visuals or the underdog empathies they arouse. 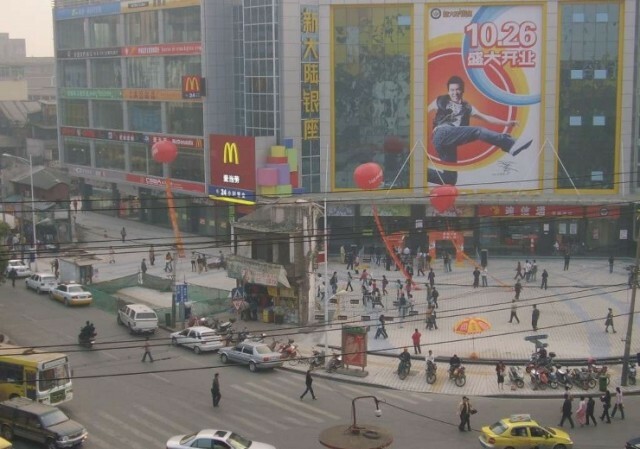 They are a rip in the space-time continuum to a counterfactual world, where China’s vernacular architecture is ceded a place. 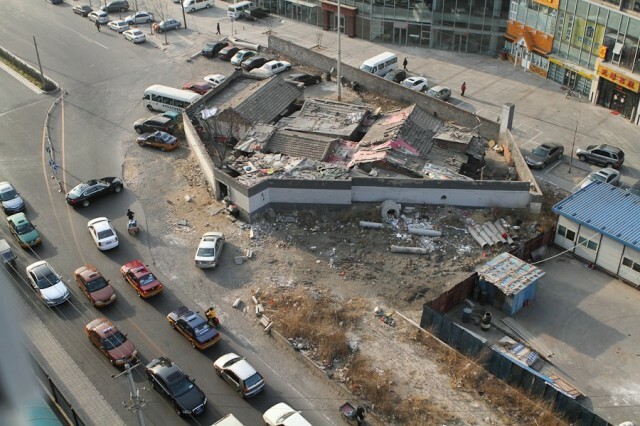 For as long as they hold out, nail houses are waypoints to the past, standing askance against the all-too straight lines of futurism with Chinese characteristics. I spent some time this past weekend hunting down some of the more famous nail houses, and collecting them into a KML file for download, ready to open in Google Earth. 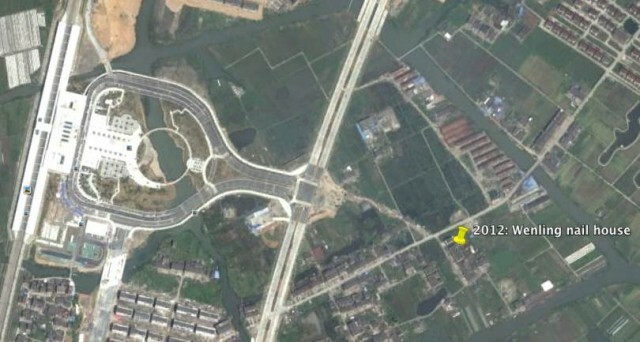 Google Earth’s database of historical imagery provides a unique time-lapse tool for peering at China’s ongoing urban reinvention, and it’s allowed me to positively identify the locations of seven well-known nail houses, including the most recent one in Wenling. In some cases, Google Earth has historical imagery showing the nail house in situ; in other cases, you only see the before– or after view. When visiting each of these nail houses in Google Earth, play with the historical imagery timeline in the top toolbar to visualize the progression of the surrounding development over the past 10 years or so. The historical imagery is not available in Google Maps or on other mapping services, so you need to use Google Earth for this. 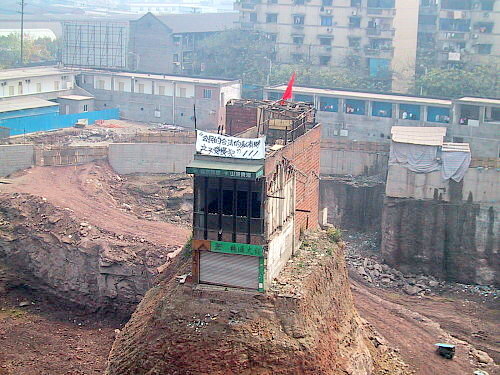 Chongqing, 2007 (population 29 million): This was the first nail house to gain international recognition. In Google Earth you can clearly see that until 2003 at least, the location was a very centrally located “snacking” street with food stalls. 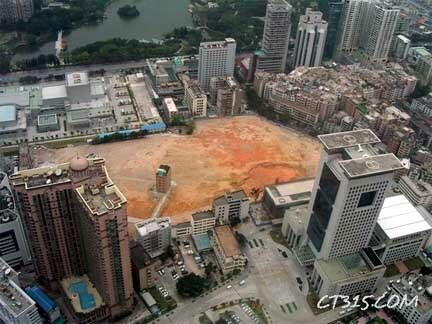 Shenzhen, 2007 (population 10 million): Turn on 3D buildings to find this nail house underneath one of the world’s tallest buildings, the Kingkey 100, completed in 2011. In Google Earth, notice the recently built railway station to the West, but also the copious fields through which the road could conceivably have meandered. The road bisecting the nail house is not yet visible in Google Earth, as the most recent imagery there is currently from 2010. There are other nail houses out there, but in several cases Google Earth’s imagery hasn’t yet caught up with recent news. If you find any yourself, let me know and I’ll add them to the collection. 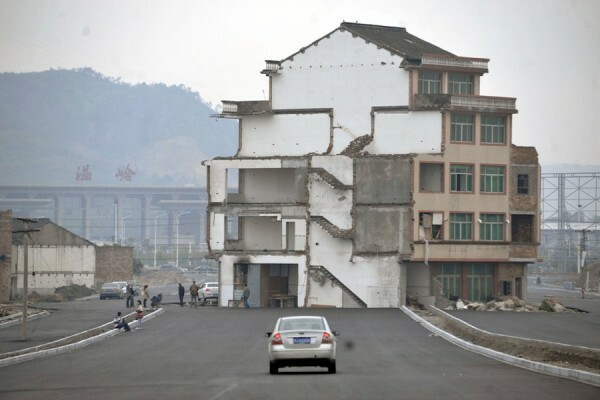 are you or are you not saying that the existence of these “nail houses” all around China shows there is continuing resistance to China’s undemocratically draconian nature of China’s current “modernisation” building drive? are you or are you not, therefore, implying that China is NOT that undemocratically draconian after all?